Australia’s Lake Eyre drainage basin sprawls across about 1.2 million square kilometers, stretching from Northern Territory to South Australia. Rain, when it falls, drains inward through the Simpson Desert basin into Lake Eyre, which has no outlet. 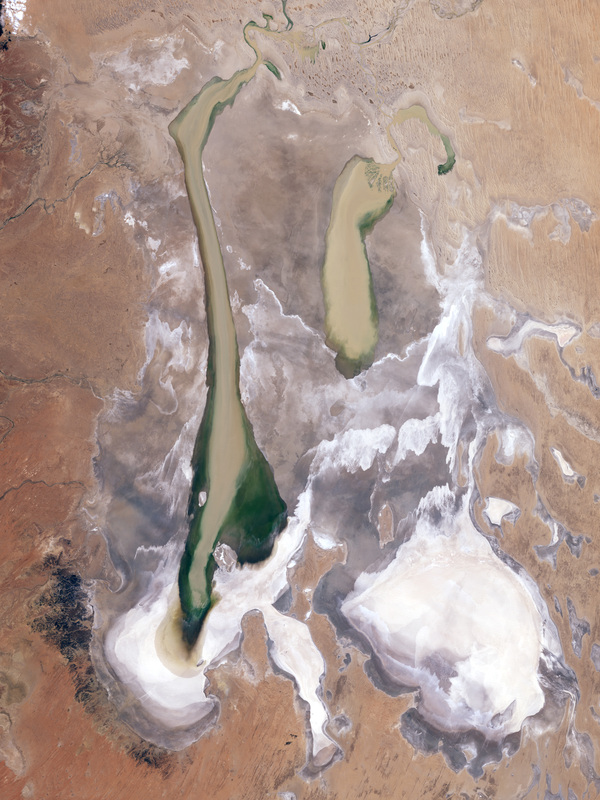 According to the Australian government, Lake Eyre is the fifth largest terminal lake in the world. But Lake Eyre does not always hold water. In fact, the lake is dry except in the wake of a rare, steady rainy season. In 2009, intense rains fell over northern Australia. A total of 17 million megaliters of water flowed through the Channel Country, soaking into the soil and sustaining grasses, reported ABC News. By March (see second large image), water had begun to reach Lake Eyre. 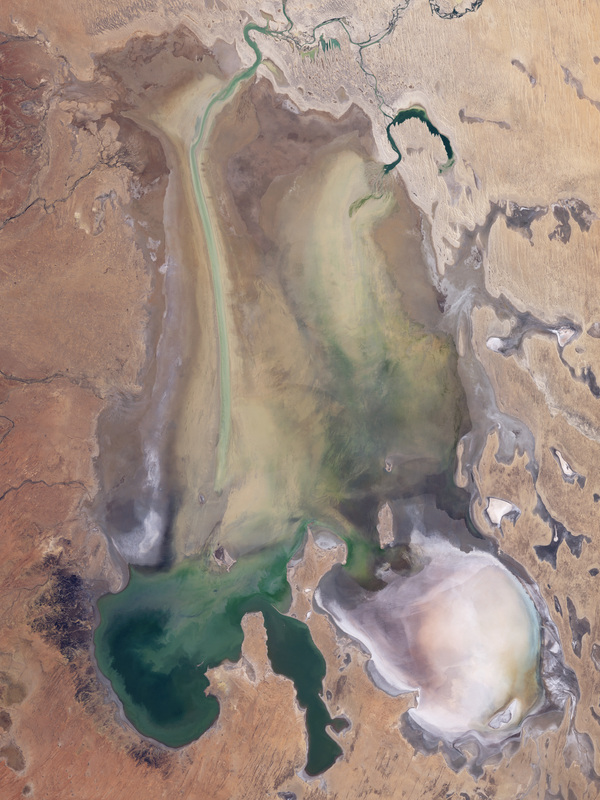 By June 10, when the Landsat satellite captured this image, the flow of water had slowed: Lake Eyre was as full as it was going to get in 2009. Shallow water covers most of the lake bed. The water is colorful, tinted green and blue by sediment and algae. 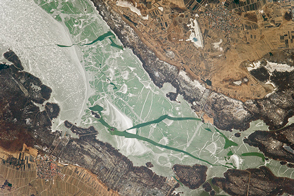 The southwestern lobe of the lake is darkest in color. According to the Lake Eyre Yacht Club, it is also the deepest portion of the lake at 1.4 meters (4.6 feet). When it fills, Lake Eyre and the wetlands in the basin provide an important habitat for birds and fish. Birds flocked to the lake when it began to fill in 2009. NASA image created by Jesse Allen, using Landsat data provided by the United States Geological Survey. Caption by Holli Riebeek. By mid-June, the rare filling of Lake Eyre, in Australia’ Simpson Desert, appeared to have reached its peak. Arthur, C. (2009, June 10). Floodwaters could fill 30 Sydney Harbours. Australian Broadcasting Corporation News Website. Accessed June 12, 2009. Arthur,C. (2009, June 10). Outback seagulls a long way from home. Australian Broadcasting Corporation News Website. Accessed June 12, 2009. Department of the Environment, Water, Heritage, and the Arts. (2009, June 1). Lake Eyre Basin. Australian Government Website. Accessed June 12, 2009. Lake Eyre Yacht Club. (2009, June 10). Current Lake Status. Accessed June 12, 2009.